Students will be given free entry on September 12th and 13th at Leopardstown and the Curragh. Helping to attract a new generation of fans to horse racing. Leopardstown and the Curragh today announced an exciting new partnership with Godolphin, the global racing stable founded by His Highness Sheikh Mohammed bin Rashid Al Maktoum, Vice President and Prime Minister of the UAE and Ruler of Dubai. 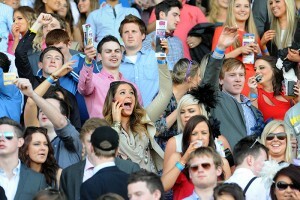 Action from the student race evening at Leopardstown. The partnership means that students will be given free entry to both racecourses on Longines Irish Champions Weekend, a two-day festival which features the QIPCO Irish Champion Stakes and the Palmerstown House Estate Irish St. Leger back-to-back on September 12th and 13th at Leopardstown and the Curragh respectively. In addition to receiving complimentary admission to the weekend’s racing, Godolphin will invite 100 students to participate in exclusive tours on Saturday and Sunday morning before racing. The visits will consist of a private tour of Kildangan Stud, including yearling and stallion parades followed by a talk from Kildangan Stud Managing Director and Godolphin representative in Ireland, Joe Osborne. On each raceday the 50 participants will also receive hospitality at the racecourses. There will also be a special prize open to all who participate in the tours. Two winners will be selected by competition to receive a trip of a lifetime to Dubai including three nights’ accommodation. The itinerary will include cultural and racing experiences. 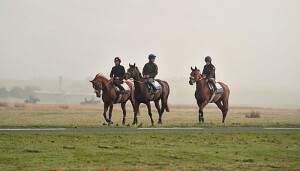 For further information please visit: http://www.irishchampionsweekend.ie. To avail of this offer, students must register online at www.irishchampionsweekend.ie before Tuesday 8th September. Godolphin was founded in 1992 by His Highness Sheikh Mohammed bin Rashid Al Maktoum, Vice President and Prime Minister of the UAE and Ruler of Dubai. Named in honour of the Godolphin Arabian, one of the three founding stallions of the modern thoroughbred born in the Arabian Gulf, what started with a handful of horses in the desert has evolved into the foremost international horseracing stable.